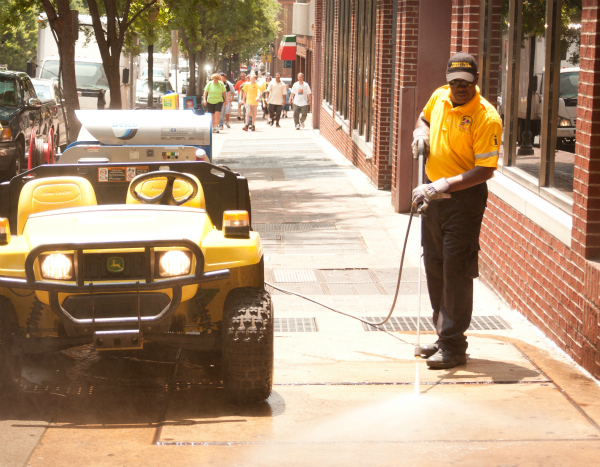 Keeping downtown Nashville clean and safe for employees, residents and visitors is the primary focus of a team of ambassadors managed by the Nashville Downtown Partnership. Every day, they pay attention to many details that help create an attractive and welcoming downtown environment. Carrying out supplemental services funded by a special assessment on properties in the Central Business Improvement District (CBID) and the Gulch Business Improvement District (GBID), this team improves the appearance of the downtown streets and sidewalks and elevates the sense of security. On foot or Segways, the safety ambassadors keep an eye out for situations requiring police or emergency services and quickly communicate with the appropriate dispatchers. Their hours in the downtown CBID are 7 am to 8 pm seven days a week. On their rotation as Hospitality Ambassadors, they provide maps, directions, and recommendations to visitors (and inquiring locals), as well as distribute guidebooks. Hours of service for the clean team in the downtown CBID are 7 am to 3:30 pm seven days a week. Also, three evenings a week (4 pm to midnight), a clean team member pressure washes areas not easily accessed during business hours. In the Gulch district, hours for the clean team are 7 am through 3:30 pm, seven days a week and for the safety team, 5 pm - 11 pm four nights a week. Wearing bright yellow shirts with the Partnership logo, the clean team pressure washes sidewalks, removes graffiti and handbills, and removes litter, trash and weeds. Remember to dial 911 for any medical or security emergency - and contact Metro Police at 615-862-8600 in cases of "urgency without emergency." You may also request one-time or recurring scheduled services by completing the online request form. Services available within the CBID downtown area and the Gulch area include pre- and post-event services in the vicinity of entertainment or meeting facilities, guides in hospitality corridors, sidewalk pressure washing, and more. The Nashville Downtown Partnership's Clean & Safe Team is happy to assist you! Real Change. Not Spare Change.